Yokohama's “Go Strong” mantra now has several new, vibrant voices. The tire maker has assembled “Team Yokohama,” an all-star line-up of drivers, lifestyle athletes and influencers to be brand ambassadors and expand Yokohama’s connection to new audiences. 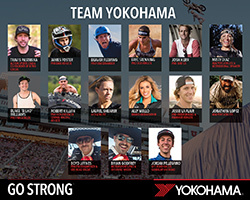 Yokohama has already worked with many of the athletes through existing partnerships like Nitro Circus and U.S. Spartan Race. Yokohama is the exclusive tire of the Nitro Circus Live Tour in the United States, as well as an official sponsor of the Nitro World Games. Yokohama is also the official tire of the U.S. Spartan Race, the world’s largest obstacle race and endurance brand.